Both skid-steer loaders and compact track loaders experienced sales growth in Canada in 2018, with compact track loaders outpacing skid steers both in terms of total sales and growth percentage, according to Debbie Townsley, product marketing manager at Case Construction Equipment. "While the trend is more stark in the U.S., there is a movement toward skid steers and compact track loaders with greater operating capacities, but we see much of the Canadian market still strongly anchored in the mid-sized class of machines, typically at or around 74 horsepower. Two size classes stick out: 1,751 to 2,000 pounds rated operating capacity (at 35 percent tipping load) and 2,201 to 2,700 pounds rated operating capacity." Gregg Zupancic, product marketing manager for John Deere, noted that the majority of the growth is driven by larger models with engines greater than 75 hp (56 kW). These models typically have higher hydraulic performance to drive larger attachments with auxiliary flows on the larger models ranging from 20 to 29 gpm (76 to 114 L/min) for a standard machine. When outfitted with a high-flow option, these machines can range from 30 to 41 gpm (114 to 155 L/min). Nathan Ryan, product manager for skid steers and compact track loaders at Wacker Neuson, pointed out that while there was growth for both types of machines in 2017 and 2018, CTL sales significantly outnumbered SSL sales in 2018 in Canada and in the US. "[Last year] growth was modest at best indicating the market is slowing." Growth is driven by larger models, Ryan added, and the classes of SSLs in which Wacker saw the most growth were the heaviest three classes with rated operating capacities of 2,200 pounds and larger. The largest portion of the skid-steer market, according to Lee Padgett, product manager at Takeuchi-US, is comprised of the mid-frame-sized loaders that are relatively easy to transport between jobs and have greater engine and hydraulic performance than small-frame skid steers. "The mid-frame loaders are able to run a wider range of hydraulically driven attachments, which makes them more versatile and valuable to a contractor." Kevin Coleman, product specialist for Caterpillar, pointed out that there are three key factors that go in to choosing between rubber tire SSLs and rubber track CTLs: purchase price, maintenance and underfoot conditions. Since an SSL also weighs less than a comparably sized CTL, he added, this allows more flexibility for transport. He also noted that while SSLs excel when used on firmer, more level surfaces, equipping an SSL with wider tires for extra flotation helps the machine navigate in softer underfoot conditions. However, it is still limited in its ability to work in wet or muddy conditions due to its higher ground pressure. 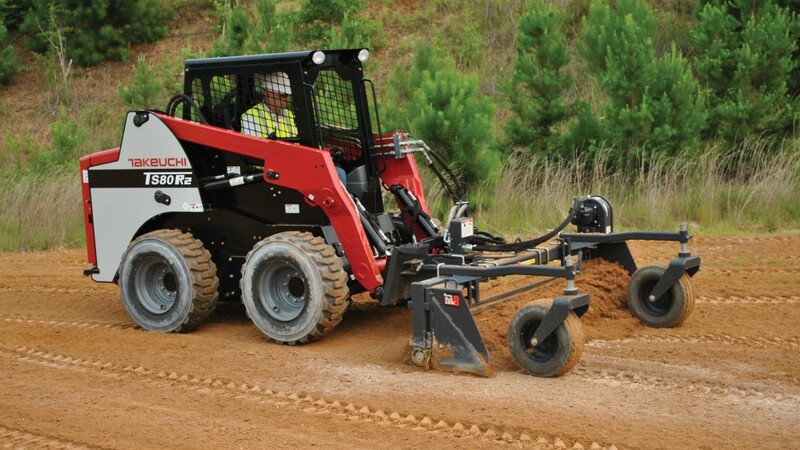 "Skid steers are ideally suited for working on improved surfaces – asphalt, concrete, hard-packed stone and gravel – when compared to CTLs," explained Townsley. "Rubber tracks on CTLs are prone to greater wear in such conditions. As such, attachments such as cold planers, sweepers and vacuums may be better suited for skid steers. We really focus on skid steers and compact track loaders as the prime platform that gives owners the ability to do a greater variety of work, and the greater attachment flexibility these machines provide their owners, the more valuable they are." SSLs hold the speed advantage, often operating at higher ground speeds than comparable CTLs, Ryan noted. "Speed, agility and a heavier ground footprint give skid-steer loaders the advantage in certain applications like clearing snow and using brooms on pavement. "Zupancic added that skid steers are more compact, nimble and lighter than a comparable CTL, cost less to maintain, have higher ground pressure, and have higher travel speeds. Jason Boerger, marketing manager for Bobcat Company, noted that SSLs have lower operating costs because they tend to be more fuel efficient and tires are less expensive to replace than tracks. Track loaders are eroding the skid-steer market to an extent, but a key limiting factor is the replacement cost of the undercarriage components versus tires on the skid steer, according to Padgett. "This is why the skid steer is a more common choice for flat work, and the track loader is more suited for applications with uneven, muddy terrain requiring greater flotation and a lighter footprint." He added that SSLs are typically at a price point that is attractive for someone starting a company and they work well in tandem with other machines like compact excavators. "Electro-hydraulic (EH) controls are now the norm for SSLs and act as a tremendous enabler for automation and integration of features allowing customers to save time and/or make more money. Many of these features assist with repetitive tasks like grading, digging and loading," said Coleman. He noted that Caterpillar's EH architecture allows the machine to provide adjustments that tailor the machine drive and implement response to the operator's task, attachment or experience level. It also provides the capability for features such as speed sensitive ride control, creeper mode, dual self-levelling, work tool positioner and return-to-dig features. Bobcat also offers ride control for their M2-Series skid-steer loaders. "The automatic ride control option reduces material spillage, allowing operators to travel at faster speeds for increased productivity. When the auto mode is selected, the system will work at any travel speed. The ride control function is automatically activated by detecting increased hydraulic lift arm pressure when the loader is carrying material. It will deactivate when hydraulic lift arm pressure is reduced – such as when there is no load in a bucket. In addition, operators can turn it off for tasks such as back dragging," said Boerger. With Case's most recent skid-steer introduction, the SV340, they've focused on providing a wider range of hydraulic capabilities – highlighted by an enhanced high-flow option that provides up to 4,000 psi for operating the most demanding of attachments. "Think: mulchers and cold planers," said Townsley. Deere offers an EH Boom Performance Package which features auto bucket self-levelling, both in up and down directions of the lift path; return to dig, a programmable setting to automatically position the boom height and attachment angle; return to carry, a programmable setting to automatically position the boom height/attachment angle to be ready to carry; and boom height kick out, which automatically repositions an attachment to more efficiently accomplish a repetitive task. In addition, the company now offers on-board grade indication for their compact track loaders and skid steers. This feature delivers an on-board readout on an LCD monitor in the cab which provides the grade of the land in cross-slope and mainfall. A feature that is making its way on to smaller machines is telematics. "Telematics have become one of the latest technologies added to CTLs and SSLs, and the benefits go way beyond theft prevention," Ryan from Wacker Neuson said. "Connected machines now tell fleet managers when they need maintenance, how often and how long they are being used and when a problem occurs, all helping to reduce the total cost of ownership." The cab is the operator's office for the day, and with that in mind, Case has focused on visibility, jobsite awareness and the ability for operators to get in and out of the cab safely and easily. "We take pride in our industry-leading 360-degree visibility, as we know that awareness of the jobsite, surrounding workers, and obstacles is critical to success and safety. We've incorporated a new, standard, cab-wide rear-view mirror to further improve visibility to the rear of the machine," added Townsley. Coleman agreed that jobsite visibility is vital. He said that the cab design should provide working visibility to the operator. Working visibility is the ability for an operator to easily see the critical areas for everyday work, including the bucket cutting edge; the sides of the bucket; the front, rear and sides of the tires; the rear machine corners; and the area behind the machine. "If a machine can provide the operator with excellent sightlines to these areas, through design and technology, such as a rear-view camera, [the operator] can be safer on the jobsite and more comfortable, which leads to higher productivity and efficiency." He added that an ergonomic cab design is also very important to operators. The cab should have an intuitive layout and things should be easy to locate, including switches, cellphone charging location, A/C controls and heads-up display panels. Any displays should be located so that the operator can view the rear-view camera in conjunction with using the standard rear-view mirror without having to crane their neck. "It's common on many jobsites for numerous workers to hop in and out of the skid steer throughout the day," said Townsley. "As such, [Case provides] electro-hydraulic controls that make it easy to switch operating patterns to the preference of each operator with the simple flip of a rocker switch." "Switchable controls are an invaluable feature to have on machines with multiple operators such as rental applications or machines used in large fleets," added Ryan. "When an operator uses the control type they are accustomed too, they operate the machine more safely and productively." Cat skid-steer loaders have an enclosed cab design that is one complete unit. The one-piece cab does not rely on sealing by compressing gaskets and foam, as found on two-piece cab designs, delivering a clean, quiet working environment, Coleman explained. Because the cab is so quiet, he said that operators can take advantage of an available Bluetooth radio/microphone to place or receive phone calls or stream music. Wacker Neuson also uses a one-piece cab design. Ryan added that heated air suspension seats are now commonly available from most manufacturers to enhance the operator's experience, and rear-view cameras are growing in popularity for safety and convenience reasons. Key features in the Deere cab include HVAC with eight adjustable automotive-style vents and cab pressurization, keyless start, heated air-ride seating, rear-view camera, Bluetooth Radio options, and removable top and side cab windows for easy cleaning. "A comfortable cab leads to higher production and less fatigue," said Padgett. "The Takeuchi TS80 features a pressurized cab available in several different configurations including air conditioner, heat and defrost for a clean, comfortable work environment throughout the year. The addition of the electronic dial throttle allowed the floor to be opened up for greater foot space and comfort, and a suspension seat provides multiple adjustments. A multi-informational display provides machine operational and performance data. Pilot controls are low-effort, reducing operator fatigue and provide consistent, reliable performance." The first thing to consider when making a purchase is the type of applications that the machine will be used for, noted Boerger from Bobcat. This will help you determine if you need a larger machine with a higher level of rated operating capacity and pushing force, or a slightly smaller machine to move in tighter spaces. Padgett said that it is important to understand the difference between vertical and radial lift loader arrangements. "Operators that do more grading and dirt work tend to prefer the radial lift design as it generally has greater bucket breakout and lift arm forces. Radial lift loaders also have excellent mid-height reach due to their lift path. Operators who primarily do load and carry and truck loading prefer the vertical lift loader for its higher rated operating capacity and better reach at full dump height." Zupancic recommended deciding what attachments you may need in both the short and long term. The attachment requirements will drive the choice in size of machine, power levels and hydraulic capacities. A machine should deliver excellent sightlines to all areas around the machine for maximum efficiency and safe operation, Coleman emphasized. "Consider if features are available that increase efficiency for frequent tasks the operator may be doing such as dual direction self-levelling for material loading/handling, return-to-dig for truck loading cycles, or creep speed control for a high-quality finish and maximum productivity with attachments such as brooms, trenchers, box rakes, milling heads, wheel saws, etc." He also said to consider access to daily service and routine maintenance items. "Daily checks/fill items, such as engine oil, should be easy to accomplish without having to reach into areas where components may be hot. Routine maintenance items, like cleaning/replacing the engine air filter should be quick and simple without requiring bolts/panels to be removed. Other routine maintenance items, like the fuel filter or hydraulic filter, should be straightforward to locate and access without requiring other components, like cabs or cooling cores, to be unbolted and moved." Boerger recommends considering cab comfort. Is a closed cab with heat and air necessary because of the conditions the machine and operator will be working in, or will a machine with an open cab suffice? Ryan from Wacker Neuson recommends taking the total cost of ownership into account. "Technology like diesel particulate filter (DPF) aftertreatment systems can significantly reduce profitability by increasing downtime to do regeneration cycles. Many manufacturers, like Wacker Neuson, outfit their machines with engines that have no DPF and therefore have a maintenance-free, regeneration-free aftertreatment system, eliminating the impact of extreme heat or the need for filters."